But don’t mistake minimalism for apathy. Quietly guiding a wine in a thoughtful, deliberate way—without intervening at every twist and turn—requires diligent attention to detail and a generous amount of restraint. The wine in the glass is born of a deeply purposeful approach. It is a gift of the land, valued and honored. Derek grows Chardonnay and Pinot Noir grapes in coveted cool-climate vineyards in Sonoma’s Russian River Valley and Mendocino’s Anderson Valley. Derek’s minimalist approach translates the nuances of each coastal vineyard in the glass, illustrating a distinct, transparent sense of place in every sip. The result is a collection of compelling, terroir-driven wines that pair naturally with food and have rare aging potential, relative to their Chardonnay and Pinot Noir peers. These wines are crafted exclusively for Bravium Mailing List members and a handful of boutique bottle shops and top restaurants. 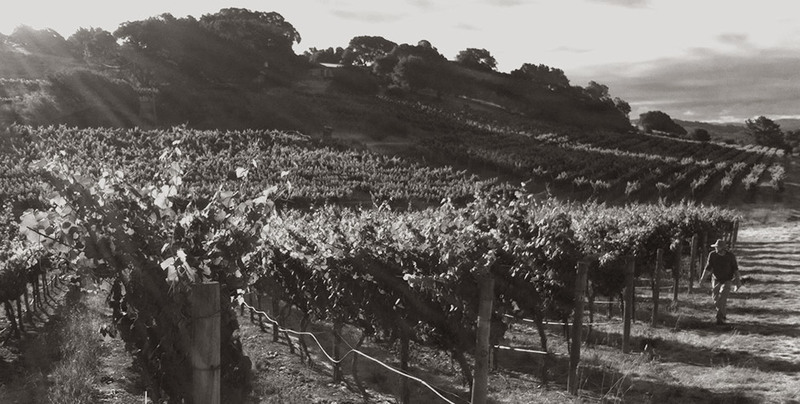 Of Cherokee descent, winemaker Derek Rohlffs was gifted the name “Winter Hawk” as a young boy. Intuitively connected to the land—Cherokee means “those who live in the mountains”—Derek has always felt a mysterious pull to nature, even as a child. To hear him tell it, the vineyard is his destiny. He doesn’t view his path to winemaking as a conscious choice, but more of an undercurrent that quietly ushered him to where he belongs. Today, Derek welcomes the sight of hawks circling over the vineyards and swooping down to the earth around him. A single hawk’s feather fittingly graces the Bravium label, echoing the power, elegance, and vitality of the wines—and of Derek’s Cherokee roots. "I feel most grounded when I am in sync with the land. Being outside, being in the vineyard—that’s where I belong." 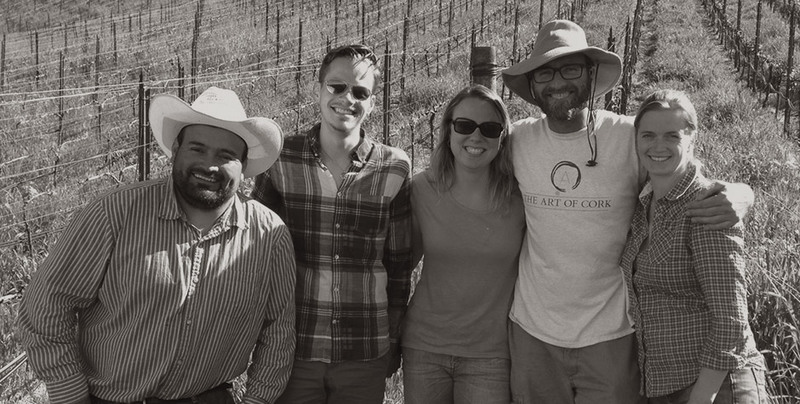 The people behind a wine may be as important—if not more so—than the vineyard itself. For winemaker Derek Rohlffs, people are an immutable element of terroir, adding experience and individuality to that intangible mix of climate and soil that gives us a wine’s sense of place. A graduate of the trailblazing Environmental Studies program at the University of California at Santa Barbara, Derek also took coursework in the world-renowned winemaking program at the University of California at Davis. His far-reaching travels have afforded in-depth visits to the wine regions of France, Italy, and Australia. But his most impactful influence may have been a retrospective tasting he experienced at Mayacamas Vineyards during his first visit to Napa Valley. Those wines captivated Derek in untold ways, and he resolved then to become a winemaker. He later crossed paths with the acclaimed winemakers at Rhys Vineyards, who steered Derek toward cool-climate, mountainside fruit. One mountaintop vineyard in particular, Signal Ridge Vineyard, resting 2,642 feet above the Pacific Ocean atop Mendocino Ridge, allowed a fortuitous meeting between Derek and the vineyard’s owner, Roger Scommegna. With its shallow soil and southwest aspect, Signal Ridge lent extraordinary fruit to the inaugural bottling of Pinot Noir crafted by Derek and Roger. That wine met with wide critical acclaim and forged a lifelong friendship and partnership—Roger ultimately became a co-proprietor of Bravium—that endures today. 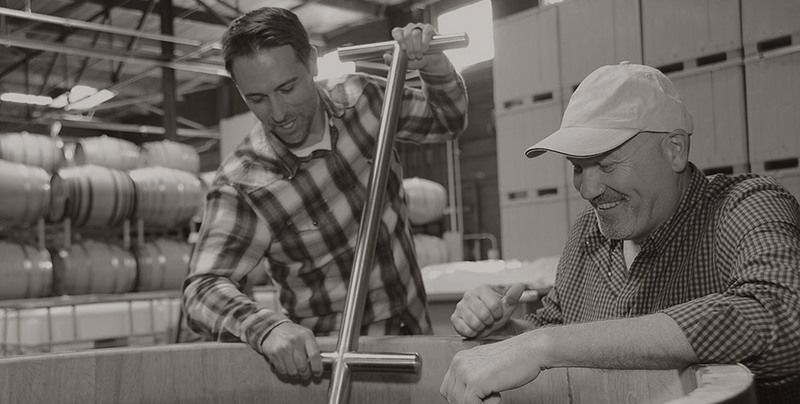 Click here for Winemaker, Derek Rohlffs' full biography. "A great wine will draw you into the people, the place, the story behind it." For a winemaker like Derek Rohlffs, intervention stands at odds with the natural world and what it gives us, both in the vineyard and in the winery. An ardent minimalist and perfectionist, Derek knows when to step aside and when to gently coax the fruit toward its ultimate potential in the glass. Bravium grapes are night harvested by hand and sorted in the field and again in the cellar. Patience is employed throughout the process. Whole cluster and destemmed Chardonnay is gently pressed to French and Hungarian oak - 228L barrels and 500L puncheons. The Pinot Noir whole cluster inclusion is driven by stem dryness and vineyard block experience. The overall blend tends to range from a judicious 10% to 30% whole cluster, with specific fermenter / clonal lots ranging from 0% to 50%. As with oak, Derek is looking to add mouthfeel and aromatic and textural complexity without overwhelming the fruit and nuanced aromas and flavors. Bravium wines age in barrel for the better part of a year. Eschewing sterile filtration allows the final wines to be terroir-driven snapshots of their vineyards and appellations. "I aspire to make transparent wines of place that reflect each vintage's unique character."